Lori's books make great gifts. If you would like to make a purchase, please contact us at lorisvoice@gmail.com. and we will make arraignments to get them to you. 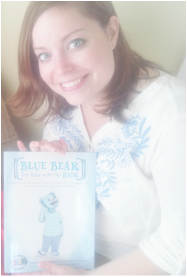 Blue Bear is a touching story about a bear who loses his hair to cancer. Bear finds his friends rallying around him with their compassion and support. own unique idea on how blue bear would look best without his cherished blue fur. ﻿﻿This delightful book tells the story of a friendship that has developed between two peculiar characters. Green is portrayed as a green coloring crayon and N.V., a plastic milk jug. While Miss Green frolics at the playground, she hears a cry from a nearby trashcan. Curiosity gets the best of her as she follows her heart to help rescue her new found friend. With a little encouragement, Green is able to convince N.V. that his life as he knows it, is much more valuable than garbage and does not have to end this way. There is always hope for a brighter tomorrow. Julie Baldwin… studied fine art at Grand Valley State University in Allendale, Michigan from 2002 to 2007, and graduated with a BFA in illustration. During that time, she also took on ﻿coursework that met her interest in graphic design and art history. After graduation, she became﻿ a full-time graphic designer and illustrator. In August of 2009, Julie moved to Scotland to attend the University of Edinburgh for her master's in art history. There she focused her research on illustration and graphic design in England during World War II. Her master's thesis examined how ephemeral images (temporary images, usually discarded after a short period of time) affected concepts of identity for those living in England at that time. It suggests that these images enabled new or changing values to be ingrained within the public mindset in ways that other forms of art or communication could not. Upon returning to Grand Rapids in 2010, she resumed work as a designer and illustrator, and has also focused her efforts on producing individual works of art. Tricia Erickson is a graduate of Coopersville High School. She has a BA from Grand Valley State University in Art & Design and a Masters Degree from Kendall College of Art & Design in Art Education. She is currently an art/French teacher at Northview High School as well as an adjunct professor for Kendall College of Art & Design's Dual Enrollment program. Tricia enjoys spending time with her family, especially her 3 children and husband Jeremy Croff, as well as friends. She loves traveling, reading, and anything that involves art and creativity. Born with a gigantic nose, Rosie Rose discovers her hidden talent and is determined to put her best foot forward inspiring her classmates to look beyond her appearance and see her for who she truly is. This book will surely keep you on your toes. After 4 years of high school art classes that covered the basics, Kathryn Nowicki decided to make a career out of her passion for art. She is a graduate of West Catholic High School and of Grand Valley State University. Kathryn continues to feel the support and encouragement from her family and friends and is very thankful for the opportunities that continue to come her way. At the age of 12, I was diagnosed with limb-girdle muscular dystrophy. Limb-girdle muscular dystrophy encompasses a large number of rare disorders. Currently, there is no cure and the disease inevitably worsens over time. The term "limb-girdle" is used to describe these disorders because the muscles most severely affected are generally those of the hips and shoulders—the limb girdle muscles. Living with muscular dystrophy has certainly not been an easy road, yet along the way I have experienced many blessings that I probably would not have, if my life had been any different. I refuse to let the extreme limitations that restrict me physically, define who I am. I have always enjoyed reading to my children and now my grandchildren. I was encouraged to write a series of children's books. Technology has played a huge role in my new adventure, because of my limited mobility, I am unable to write using a keyboard, I use voice activated software and have dictated each book that I have written using a computer. 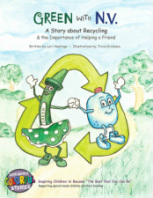 Each story line is intended to encourage children to overcome obstacles. It is my hope that every child who reads my books will be inspired to become the best that they can be, regardless of their life challenges. 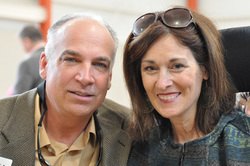 The sales of each of my books goes directly back to Lori's Voice organization. My love of children and reading, ignited a spark and together with a team of hard working, dedicated friends, we formed the nonprofit organization, Lori's Voice. My goal is to enrich the lives of challenged children and make their lives a little easier by providing them with special medical equipment, summer camp scholarships, voice activated software, braces, basically things that insurance would typically not cover. Will you please join me in making the lives of children with special limitations a little easier by making a donation?